Jeffrey Hamelman's Challenge - Bagels. The Bread Challenge that is getting us bread enthusiasts to try working on the recipes in the book, one or two recipes a month, and start from anywhere. Here's the link to The Bread Challenge. I went out to buy my Jeffrey Hamelman's book "Bread - A Baker's Book of Techniques and Recipes", ordered it over www.amazon.com and picked it up when I was in US. Lugged all the way back and looking forward to working on the recipes, inspired by many who had tried. One of the members of the Bread Challenge inspired me to try this. I was totally inspired by Lindy, a member of www.thefreshloaf.com who made the these beautiful bagels. See the link here: Lindy's Post. I looked closer at the recipes, it requires a number of special items. Diastatic malt powder, what is this? I asked the fresh loaf members, researched. Well, I can't find it in China. I tried to sprout my own, using barley berries, it just didn't work. Then I look again, high gluten flour. What is this? I researched again. It has protein level of 13 - 15%, and is spring wheat that has high gluten. Some brands have them. I searched again in most of the supermarkets with imported goods, I couldn't find anything that states high gluten. The best that I got was Japanese strong flour - 12% protein level. Ok. I don't have high gluten flour, I don't have malt powder or malt syrup. But I need to make the bagels. I went ahead anyway. Mix all ingredients together and bulk ferment for 1 hour. Divide the dough into 2 oz each (in JH's book, it's 4 oz each - I wanted a smaller bagel) Flatten them one by one, make into a square and roll them into tight cylinders. (I think mine was a little thin). Roll each dough not too long, enough to wrap around 3 of your fingers for the 2 oz, 4 of your finger if 4 oz. Put the 2 ends together ( I realised the ends should be fatter). wrap around the 3 fingers and roll the 2 ends together, till they join together. I managed to make 12 pieces of bagels. 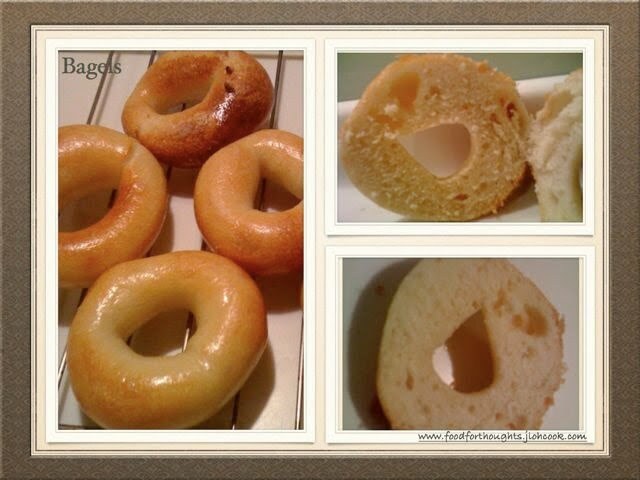 Place them in sheet pans and refrigerate the bagels at least 6 hours - covered with plastic. After 6 hours, get the oven ready before preparing the bagels. 250 degrees celsius. Get a large pot and prepare boiling water, add some honey and 3 tbsp of brown sugar. Put in the bagels. The bagels suppose to puff, but mine didn't seem to. Boil for 45 seconds, and take them out and put into water with ice and soak for 3-4 minutes. Again I don't have any bagel boards, I just used baking paper. 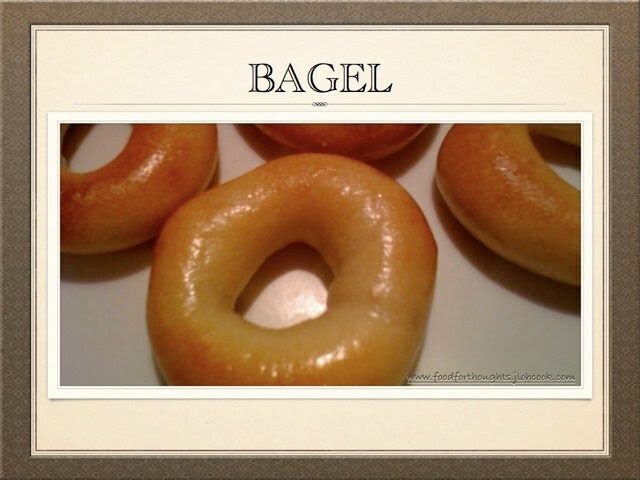 Put the bagels on the baking tray with baking paper. Bake for 3-4 minutes when it is dry on the top and flip the bagels the other way and put it directly on the cast iron skillet (suppose to be baking stone which I don't have). The dough puffed up a little. The total baking time is 20 minutes as mine didn't brown after 18 minutes. Here's my bagel. It looked more like doughnuts, but the taste is acceptable. The crust is shiny because of the syrup, and the crumbs are very very chewy. Eat it with cream cheese. I would have love to try it with the full ingredients indicated, as I think mine didn't puff as lovely as Lindy. My son gave a 6/10 on this and now he says it is more like donuts. He and I loves bagels with cream cheese. I will and want to try this again if I can get my hands on malt powder. I found wheat berries and I'm trying to sprout it now.